John May, MD, has seen plenty of desperation and disease in his line of work: US prison health care. But nothing could have prepared him for what he found when he began volunteering in prisons overseas, from Haiti to Tanzania. Behind the concrete walls and locked gates of developing world prisons, Dr. May, chief medical officer of Armor Correctional Health Services in Miami, has found that HIV and TB infection are rampant—and the tools to treat these infectious diseases are essentially non-existent. Changing that equation has been difficult at best, involving small triumphs amid a sea of obstacles. On one side there’s an environment ripe for disease transmission—overcrowded, unsanitary facilities and skeletal health services. On the other, there’s donor indifference, developing country instability, and bureaucratic headaches. 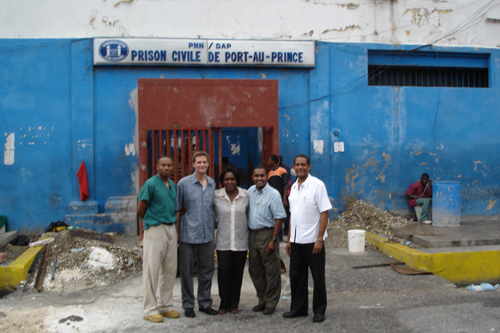 Take, for example, Dr. May’s first volunteer trip in 2001 to the National Penitentiary in Haiti’s capital, Port-au-Prince. His interest in the Haiti prison had been piqued two years earlier by a “60 Minutes” report about dire conditions at the prison. On that first foray, Dr. May traveled alone, carrying little more than a list of names–health and prison officials he hoped to meet with. After four days of knocking on doors, he’d won permission to visit the penitentiary, then housing about 1,200 inmates. Since the “60 Minutes” story had aired in 1999, Dr. May expected to see some improvements. Instead, things were worse. Dr. May acknowledged feeling overwhelmed, but not deterred. “Once I was there, I realized you could not ignore it, because if we weren’t going to be there, then no one would be,” he said. Dr. May returned to the US and described the situation to some of his correctional health colleagues, who agreed to get involved. He founded Health through Walls, a non-profit organization of doctors, nurses, and others dedicated to helping developing countries build sustainable health care programs in their jails and prisons. He and other volunteers started making regular trips to Haiti, funded by their own donations and on their own time. In addition to Haiti, Dr. May and other Health through Walls volunteers have done work in the Dominican Republic, Jamaica, Tanzania, Ghana and elsewhere. drug-resistant disease, TB in particular. He recounted the story of a 28-year-old prisoner in the Dominican Republic who was diagnosed with multi-drug resistant (MDR-TB). As is sometimes the case in poor countries, prison officials released the infected inmate, sending him home to die—and potentially to expose his friends and family to drug-resistant TB. But Dr. May has found that argument a hard sell—even among US and international agencies whose mission is global health. Until last year, for example, USAID was prohibited from funding health-related work in overseas jails and prisons, according to Dr. May. Last year, Sen. Patrick Leahy, D-Vt., worked to get that ban overturned, and Health through Walls will be the first recipient of a significant grant under this new authority. That’s not the only recent transformation he’s seen. Health through Walls also got its first grant last year–$50,000 from the Gilead Foundation, which allowed the group to hire a local Haitian physician to provide some HIV and TB testing and treatment in the Port-au-Prince prison. In the past year, they’ve been able to put about 25 HIV positive prisoners on ARVs. The HIV care and treatment, including availability of antiretrovirals in the prison, is being coordinated through William Pape, MD, director of Haiti’s GHESKIO Center and a professor of medicine at the Weill Medical College of Cornell University. Health through Walls is also partnering with Paul Farmer, MD, and his non-profit group Partners in Health to develop a mechanism of treating Haitian prisoners with MDR-TB. Dr. May says Health through Walls is also set to launch a much bigger health “blitz,” in collaboration with USAID, UNAIDS, the Haitian government, and a collection of other organizations, to screen the entire prison population for HIV and TB. For the TB component, they have a donated digital x-ray machine and a group of radiologists who’ve agreed to read the x-rays for free. But even as Dr. May has marshaled resources to confront this crisis, the need has spiraled. The prison population in Haiti’s penitentiary has swelled to more than 4,000, all housed in the same space that held 1,200 when he first visited. “Now we see patients who have swollen legs just from prolonged standing because there’s not enough room for them to lie down,” he said. “As horrific as that sounds, there has been tremendous progress. We no longer see deaths from malnutrition or Beriberi,” a nervous system disorder caused by thiamin deficiency. Asked what could be done in Washington to make his mission easier, Dr. May said that as lawmakers craft and fund global health initiatives, they need to be more aware of the needs of prisoners, the threat of infectious diseases within these institutions, and the consequences to the broader public of failing to provide basic health care to inmates. This program profile was developed by the Center for Global Health Policy. Help us showcase your innovative research or treatment on HIV or TB. To learn more, visit our new website at www.idsaglobalhealth.org. Sadly, the Haitian prison was destroyed in the 2010 earthquake. Hopefully Dr. John May survived to continue his vital work. Thoughts, news and analysis from the staff of the Infectious Diseases Center for Global Health Policy on the latest developments in tuberculosis and HIV/AIDS. Please consider subscribing to our RSS feed. Alternatively, you can receive Science Speaks posts by email, follow us on Twitter, or become a Facebook fan!